Be the first to share your favorite memory, photo or story of Derral. This memorial page is dedicated for family, friends and future generations to celebrate the life of their loved one. 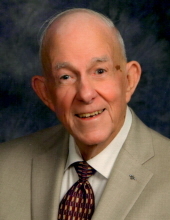 Mr. Derral Lee Brown, 88, of Richmond, passed away Sunday, January 20, 2019 at his home. Mr. Brown, the son of the late George A. Brown and Hazel Emerine Brown, was born in Wray, Colorado on May 20, 1930. As a U. S. Veteran of the both the Air Force and Army, he went on to retire as an instructor for the Civil Service. He was a volunteer for the Boy Scouts as a Scout Commissioner and also for the Salvation Army. He was a member of the First Presbyterian Church. On March 27, 2014, Mr. Brown united in marriage to Sharon Moore Brown who survives. Other survivors include: his son: Michael (& wife Jane) Brown of Round Rock, TX; his daughter: Cheryl King of Nicholasville; step-son: James (& wife Helen) Stogner of Franklin, OH and two step-daughters: Amy (& husband Marvin) Land and Heidi (& husband Merlyn) Yeager; his grandson: Chris King, seven step-grandchildren and eight step great-grandchildren. Mr. Brown was also preceded in death by his brother-in-law: Elmer Moore. Funeral Services will be conducted at 12 Noon Friday, January 25, 2019 at First Presbyterian Church, W. Main St. Richmond, with Dr. Curtis T. Christian officiating. A Committal Service will be held at 2:30 PM Friday at Camp Nelson National Cemetery in Jessamine County with Full Military Honors. Visitation will be after 10:00 AM Friday at the church. Pallbearers will be Chris King, D. J. Newton, Marvin Land, Jamie Stogner, Zachery Yeager and Shawn Adams. "Email Address" would like to share the life celebration of Derral Lee Brown. Click on the "link" to go to share a favorite memory or leave a condolence message for the family.